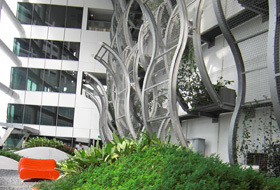 There are a total of thirteen roof gardens in the Fusionopolis skyscrapers in Singapore. The final plants chosen here are successful and even after two years still provide a wonderful picture. The lush green of the small bushes and shrubs at the roof edge is a visual treat for those seeking relaxation and respite. The decisive factor for permanent greening success is that the plants chosen are suitable for the prevailing lighting conditions. 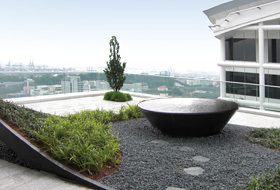 In Asia, water elements are part of every garden design: this is a pond on the 22nd floor in an exposed location. This most impressive type of vertical greening swings upwards across three floors. Once again an opportunity to sit down or stretch out, right in the middle of the green landscape. The drainage element Floradrain® FD 40 is a core element in the ZinCo system build-up and the basis for permanent greening success. The island nation of Singapore has a land mass the size of which is comparable with that of Hamburg. Due to the scarcity of land, it is no surprise, therefore, that there is a preference here for high-rise buildings. Such is the case with Fusionopolis, a complex consisting of three towers with up to 24 floors each and a total floor area of 120,000 m². As an R&D Centre, it provides the basis for the new high-tech centre, “One North”, together with the biomedical centre, Biopolis. A further six buildings are planned. The Japanese architect, Dr. Kisho Kurokawa, planned Fusionopolis as a “layered city”. Working areas, shopping malls, administrative offices, apartments, restaurants and a fitness centre with swimming pool are all stacked vertically, one on top of the other. Roof gardens play a vital role here, providing a balance between the landscape design and the practical benefits for the inhabitants. Naturally, when creating these “sky gardens” special factors such as wind, drainage and logistics proved to be a particular challenge with the skyscrapers. Both the main gardens and the glazed “skybridges” that connect the adjacent towers are found on the strategic floors (i.e. on the 5th, 17th/18th and the 21st/22nd). 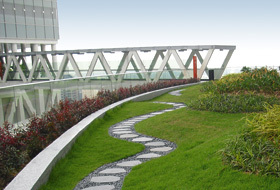 A total of thirteen themed roof gardens were created, with dense planting of 4 – 5 m high trees or 1 – 2 m high shrubs. In addition, up along the entire height of the buildings many small balcony gardens were built outside office areas. 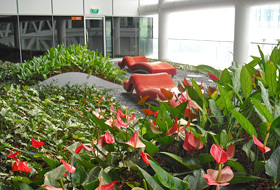 The roof gardens of Fusionopolis act as a “green lung” to provide a cooling effect in the tropical climate of Singapore (constant temperature of between 24°C and 31°C and average humidity of 75%). The shape and location of the three towers were planned in such a way that the cooling effect would not be limited to the greened floors but that the fresh air could flow through other parts of the complex. This has resulted in a reduction in the overall temperature in the environment. 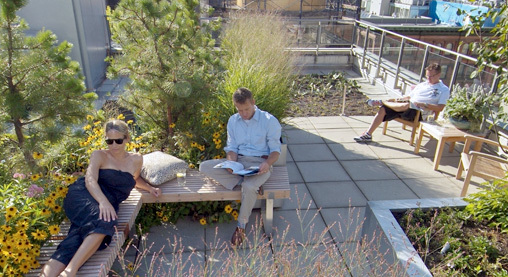 Furthermore, the green roofs are intended to be areas of recreation, relaxation and also communal areas. In hectic Singapore, it is more efficient to bring nature to the office than the other way round. The inhabitants don’t have to go all the way down to the ground floor and can find those few moments of tranquillity and inspiration right on their doorstep. The balcony gardens are also visual buffers and provide the inhabitants with a vital private sphere. ZinCo Singapore based the planning of this green roofing project on the landscape concept and adapted it to suit the requirements of the specific building project. There were already sunken basins available for the vegetation, all a consistent 75 cm in depth, interrupted by the concrete slab covering. In a first step, a root-resistant roof membrane was installed in all of the plant basins, which were then flooded over a number of days, providing proof that they were indeed impermeable. Then, a number of secondary concrete dividers were built into these extensive basins and drainage pipes inserted in order to connect the resulting individual sections. The areas that are to be pathways and those that are to have extensive planting were covered with trapezoidal sheet metal and a secondary concrete slab was poured over this. By creating this hollow core, structural loads were kept to a minimum. The existing basin depth of 75 cm was only fully used for the system build-up in those sections where trees were to be planted. 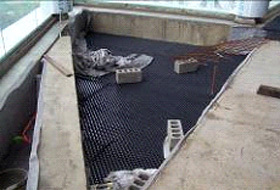 Protection mat ISM 50 was then installed on the roof membrane and the drainage element Floradrain® FD 60 was installed across the entire surface. This was then filled with Zincolit® Plus and covered with filter sheet SF. In areas where shrubs and ground-covering plants were planned, it was sufficient to use the ZinCo system build-up with Floradrain® FD 40, which is shallower. 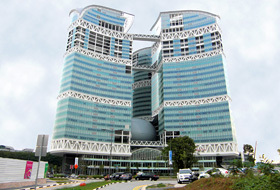 The chippings substrate originates from neighbouring Malaysia and South China – another example of the sustainability of Fusionopolis as this is recycling material. While the light-weight, pressure-resistant Floradrain® drainage boards are easy to transport to the required floor, conveying thousands of cubic metres of substrate took on an entirely different dimension altogether. As there was no way of transporting the substrate up to the various floors on the outside of the glass façade, it had to be brought up, sack by sack, in the service lift. And, this had to be done during the night to avoid getting in the way of the other trades people working on this large building site. With the drainage system, Floradrain®, water for the plants is stored in the storage cells and the surplus water is safely drained off through the underlying channel system. The water reaches the outlet, which is outside the plant bed, through the above-mentioned drainage pipes in the secondary walls. Covering the drainage layer with the filter sheet in the ZinCo system build-up ensures that fine particles cannot enter the pressure flow drainage system that is used across the entire Fusionopolis project. Future maintenance work is easily carried out using the inspection chambers. A fully-automatic drip irrigation system is installed for the required additional irrigation of the plants. On a daily basis, 14,000 litres of industrial water and grey water flow into the 54 irrigation zones in the system. The exposed location is responsible for the high level of water consumption of the plants, as the wind dries out the upper layer of the substrate very quickly. Singapore is neither in a strong wind zone nor are there tornados or cyclones in the region. For structural engineering purposes, a wind speed of 97 km/h at ground level is used (comparison: due to tornados, the figure used for the Philippines is 240 km/h). Nonetheless, the Fusionopolis green roofing was planned and executed in such a way that wind impact (pressure, suction and frictional force) is minimized, particularly in the upper floors. Measures included deeper substrate layers and gravel and slab coverings around edges and corner areas that are particularly at risk. Only small trees with a small root ball are used and they are anchored with a steel cable. The above-mentioned secondary walls in the plant basins were very useful in this case as the steel cables were inserted through them. As a result, it was possible to completely avoid penetrating the roof membrane for anchoring purposes. There is a totally different dimension to the Fusionopolis roof gardens due to the most diverse types of vertical greening used here. Climbing plants trail up along individual, stainless steel cables, at times covering more than two floors. Another most impressive type of vertical greening can be seen on the 18th floor: an s-shaped steel structure stretches up along three floors or 15 m from floor to ceiling and is gradually taken over by the climbing plants. ZinCo system build-up provides a secure base for all these types of greening. In addition, Fusionopolis offers many more landscape architectural highlights: the most diverse types of pathways and communal areas with seating among bedded plants or in the middle of a pond landscape. Given that the presence, sound and sight of flowing water are particularly significant in Asia, water elements are an integral feature in any garden design: Fusionopolis has various pools, ponds and streams. The ZinCo system build-ups created the foundation for lasting, reliable plant growth. 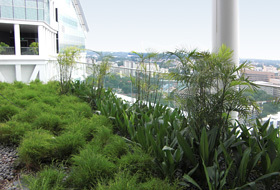 However, some plant types chosen by an Australian landscape consultant were not able to withstand the extreme conditions prevailing on a skyscraper and had to be replaced after three months. Michelia Alba, a plant that had been planted along the balustrade line on the 21st/22nd floor was very much affected by the impact of the wind (dried out quickly, constant vibrating). On cloudy days, plants that are situated at a distance of more than 10 m from the edge of the building have to do with 400 – 500 lux. Here too a particular tree type had to be replaced with a shade-loving tree. The final choice of vegetation has established itself perfectly over the past two years. The decisive factors are horticultural knowledge and due consideration of the local climatic and micro-climatic conditions. Once again it has been proven for ZinCo that careful, project-specific planning is essential to greening success. This is particularly the case for such exceptional greening projects as Fusionopolis.